If you're a regular reader of SOS 's Sample Shop pages, you can't have failed to notice the increase in the number of sample libraries being sold with virtual-instrument 'wrappers' or front ends, to the point where traditional sample CDs or CD-ROMs are beginning to look as viable as the dodo. And it's not hard to see why — the sheer convenience of accessing sounds via the familiar interface of your favourite sequencer is hard to beat, compared to dragging in multisamples from a CD-ROM, or looping and multisampling material from audio CDs. This pair of plug-in instruments from long-standing sound designers and sample-library creators Wizoo (the team behind Steinberg's Hypersonic virtual instrument) take the concept a little further. If instrumental sample collections can be packaged with plug-in front-ends, why not loops of rhythmic material? 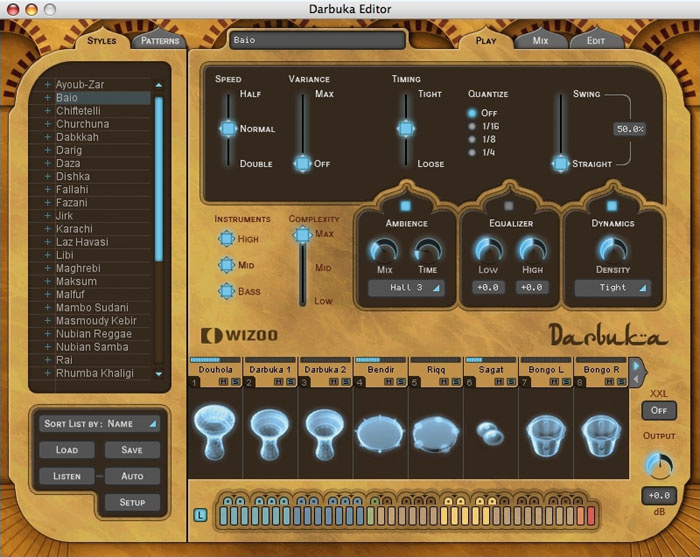 Such is the rationale behind Darbuka and Latigo, two 'virtual percussionist' instruments that offer users the sounds and performances of the Middle East and Latin and Central America respectively, in surround sound if you wish. Neither Darbuka nor Latigo allow direct access to individual percussion hits, although of course you could resample them if you wanted to. At their collective hearts are large collections (1GB for Latigo and 2GB for Darbuka) of themed percussion performances featuring instruments typical of their genre, played by experts in their field. It's rather as if a group of the most patient (and cheap!) session percussionists were living on your hard drive. A healthy selection of typical styles is available, with individual instrument patterns that can be triggered solo or en masse, complete with variations, intros, fills and other extra material. And of course it all integrates simply into your host sequencer. 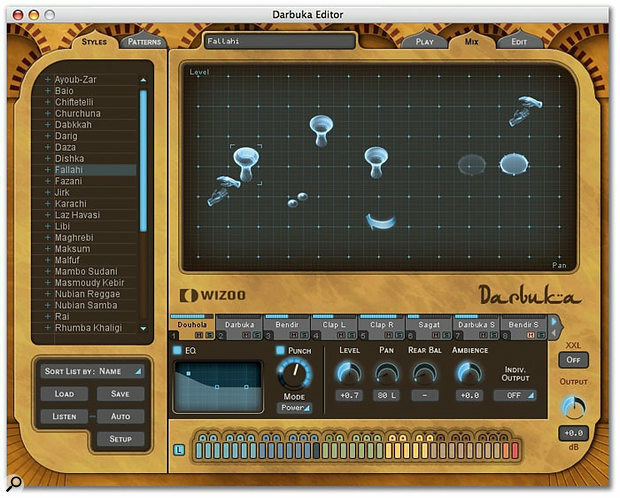 Providing access to the sampled performances in both of these plug-ins, and allowing users to manipulate them and inject something of their own personality is Wizoo's new Flexgroove virtual-instrument engine, a technological development which is apparently planned for use in more Wizoo libraries. As you might expect, both libraries allow you to play back their looped performances at any tempo while sync'ed to a host sequencer (triggering via an attached MIDI keyboard or on-screen with a mouse), but Flexgroove goes further than that. You can customise the final arrangement, loosen or tighten a performance with timing effects, quantise performances, adjust Complexity (which makes a sampled performance more or less busy) and freely set level and pan for all instruments. And all this is done via an intuitive graphical front end. Despite the different performance loops in these instruments and the different overall musical styles, these two plug-ins are conceptually and operationally identical, so be aware that my comments on usage apply to both Darbuka and Latigo unless otherwise stated. This 2GB Middle Eastern collection features two percussionists — Suat Borazan and Mohamed Zaki — playing no less than eight instruments in various rhythmic styles from Egypt, Algeria, Lebanon, Turkey, Sudan, Tunisia, Morocco, and Libya. All in all, these are very groovy performances, recorded with a very 'live' feel. The Setup display is as one might expect, providing control over the number of individual outs, sync mode and other global options. The collection's name is also the name of one of the drums being played: it's a single-headed, waisted, hollow hand drum played with both hands that's found all over the Middle East. Also in the set is the 'douhola', a kind of bass darbuka. 'Bendir' and 'riqq' are both circular hand-held frame drums, the latter being rather like a small tambourine. Finger cymbals are an effective part of the mix: the small ones are called 'sagat', the larger 'tura'. The collection also features, rather less exotically, bongos and shaker. They need no introduction to SOS readers, but fit well with the rest of the ensemble. A reversed darbuka or douhola hit also appears in some styles. Before having a look at the software, let's get some naming issues out of the way. Wizoo have made their nomenclature a little confusing, though in practice it's fairly straightforward. At the highest level, both programs contain lists of Styles. A Style in Flexgroove-speak is a thematically related collection of percussion performances (known here as Patterns). The confusion arises because each Style can accommodate up to 14 percussion instruments, arranged as Tracks. These track/instrument combinations play back individual rhythms, dubbed Grooves or Parts by Wizoo. Multiple Grooves/Parts set to trigger simultaneously from one MIDI event form a Pattern, and each Style can contain Patterns triggered by each MIDI note in a five-octave range. Keeping it simple, a Pattern could contain just one Part, say a kick-drum performance. Equally, it could contain several Parts: a combination of kick, snare and hi-hat Grooves played from one key as a Pattern. When you fire up Darbuka or Latigo, the first screen you see is the Play window. There are three main windows in total, although each one has four common elements, namely a Style/Pattern name display (of which more in a moment), a five-octave pattern trigger mini-keyboard, the master volume control, and a switch labelled 'XXL'. All samples within the plug-ins are provided in two formats, either RAM-intensive full-bandwidth samples or more economic examples treated with lossless data compression, and the XXL switch makes the choice between the two. In practice, I could discern no audible difference between them, and the software defaults to loading the compressed samples. Darbuka's Play page, complete with typically geometric Arabesque look. The vertical Style/Pattern list on the right is also visible in all three operating windows. Initially, the Patterns will all be related, producing rhythmic elements that belong to the selected Style, but you're free to collect Patterns from different Styles and assemble them into new Styles, to edit their playback settings and save them for future exploitation. Styles are loaded and saved via the display immediately below this part of the window. When you access the Play window, a row of eight percussion 'tracks' appears at the bottom, which fill up with percussion icons when a Style is loaded. Each icon relates to a particular drum, and you gradually become familiar with them as you work with the plug-ins. In this window, each track has a Mute and Solo button plus a level meter, but clicking on the name brings up the Mix page, of which more later in this review. If a Style has more than eight 'tracks' (there can be up to 14, remember), the row can be scrolled left or right as required. 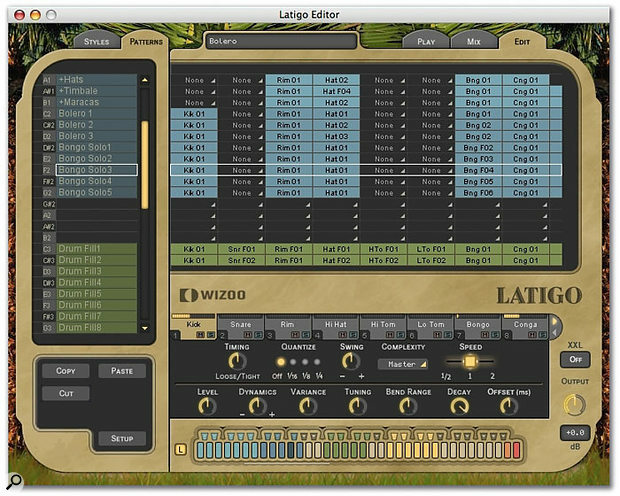 MIDI control within Latigo and Darbuka doesn't begin and end with note triggering and MIDI Clock. In fact, most on-screen controls can be easily and quickly assigned to respond to incoming MIDI controller data. You can choose from a pop-up list or have the parameter learn from the incoming data stream. The remainder of the Play page offers control over some global parameters. The master controls for the plug-ins' built-in 'Ambience' processor, for example, are found here — that's reverb to most of us. It's simple, yet rather pleasing: there are three varieties each of hall, chamber, room, ambience and stage algorithms (here called 'characters'), plus just two controls, one for the wet/dry mix and one for the Decay time. The reverb sounds smooth, though, and suits percussion well — not an easy job for digital reverb. Other master processors accessed on the Play page include 'dynamics' and a two-band EQ. The former, a kind of preset adaptive compressor, is even simpler than the Ambience processor, offering just fast, tight or slow responses, and a single control, confusingly labelled 'Density'. Master pattern-playback parameters are also located at the top of the Play page (although individual patterns can be altered in the Edit window to have their own offsets to the values entered here). These playback parameters are where Flexgroove really comes into its own. First of all, there's a Speed control. Both plug-ins can sync to themselves, running at the nominal tempos of the selected Style or Patterns, or have everything sync to the host application. Leaving the plug-ins to run together at their own tempo can lead to some interesting polyrhythmic results! But whether sync'ed to the host or not, the Speed control lets Darbuka or Latigo play at double or half the overall tempo, which is great for those moments when plug-in tempo and host sequencer tempos are so far apart that the feel is suffering. The next playback parameter is Variance, which, as its name suggests, adds variations to patterns within a Style by borrowing hits from other Patterns. The resulting extra complexity can be subtle, but completely in keeping with the current Style. 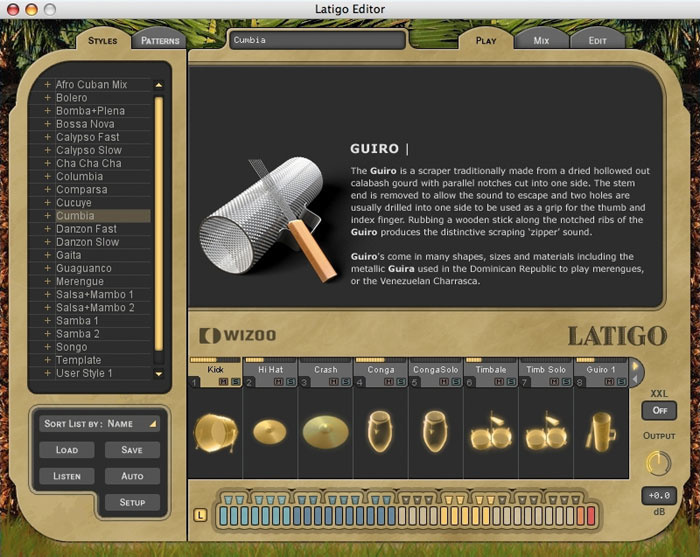 If you're new to the percussion instruments offered by Wizoo's software, keep yourself informed by right-clicking on the percussion icons in the Play page's track list: the main display area then brings up a full-sized picture of the chosen instrument and offers a paragraph of description (see the screenshot on the last page of this review). If Variance is an odd parameter for what is essentially loop-playing software, then Complexity, accessed via a three-position slider, goes even further. The three levels (Low, Mid and Max) determine how 'busy' the Patterns in a Style will be. Imagine being able to ask a session percussionist to just lay back a bit and take it easy: that's what this parameter does. Even if a pattern is incredibly busy, the simplified version resulting from a reduction of the Complexity parameter still makes musical sense, and preserves the 'feel' of the original performance. Next door to the Complexity parameter is another, dubbed 'Instruments'. This is the one parameter that works slightly differently depending on whether you're using Latigo or Darbuka. 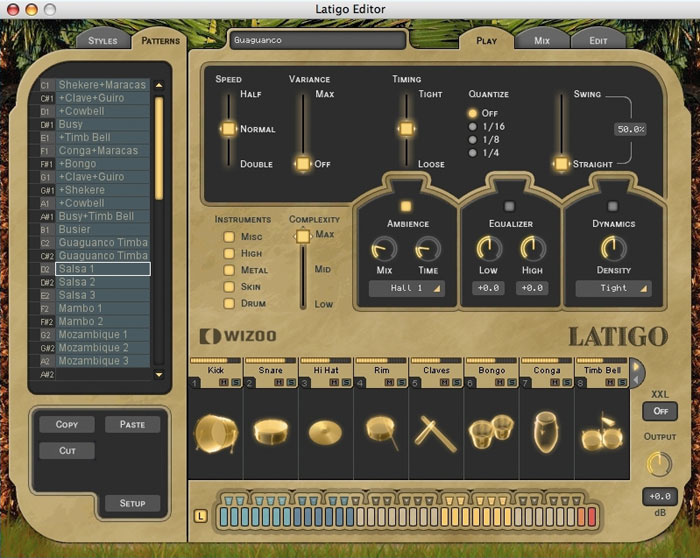 The parameter simply divides the plug-in's percussion voices into broad groups — five for Latigo (Drum, Skin, Metal, High and Miscellaneous) and three for Darbuka (Bass, Mid and High) — and lets you mute or enable them on the fly. These divisions allow users to subdivide their percussion section either for creative purposes, or for fine-tuning portions of a mix while having instant access to all the voices playing in a Pattern. The remaining controls govern more recognisable sequencing parameters. Timing lets you tighten up or loosen the performances: at one extreme, they become 'robotic', and at the other they can become exaggeratedly loose. Quantise (with Off, 16th-, eighth- or quarter-note options) also does what it says on the tin, and Swing adds a fixed triplet feel that's most effective when you've tightened up the performance with the timing control. Put all these features together — along with the Pattern-specific parameters we'll encounter shortly — and the basic library becomes almost infinitely variable. Latigo's Play page — note the jungly background! With a name that's slightly less explicable than that of Dabuka, if perhaps more immediately reminiscent of its content, this 1GB collection features the input of three members of Gloria Estefan's backing band, Miami Sound Machine: producer Clay Ostwald and percussionists Edwin Bonilla and Olbin Burgos. The set is as wide-ranging, geographically, as Darbuka; it takes in rhythms from all over Latin America and the Caribbean, as well as recent North American mélanges such as salsa. It manages to pack in examples of more instruments into roughly half the space of Darbuka, too. Instruments used that you might be familiar with include agogos, bongos, cabasa, claves, congas (including, from largest to smallest, tumba, conga and quinta), cowbell, cuica, maracas, guiro, samba whistle, shaker, timbales and triangle. On a more exotic note, you'll also find patterns played on bombo (a large Brazilian two-headed drum), caxixi (a woven basket shaker from Brazil), djembe (a West African single-headed drum), ganza (a Brazilian metal tube shaker), pandeiros (a large tambourine), reco reco (rather like a guiro, this is played by rubbing a metal bar across a pair of springs), repenique (a Brazilian tenor drum), shekere (a gourd covered with woven beaded netting), surdo (the samba bass drum), tambora (a double-headed barrel drum) and finally guataca, a Brazilian cowbell. And that's not quite all: a more or less standard drum kit is also part of the sonic signature of this music. A kick drum, snare, sidestick, sticks, hi-hat, toms, and crash cymbal usually play together in some combination or other, but can indivudally be solo'd or muted out of a mix. The Mix window, shown on the previous page, offers one of the most graphically interesting approaches to mixing I've seen recently. An X-Y grid (the Stage), dominates the screen, and is populated by percussion icons. To alter level and pan, you simply grab an icon and move it up and down (level) or and left and right (pan) respectively. It's really simple, and yet provides you with instantly comprehensible visual feedback about your percussive mix. If I liked nothing else about these plug-ins, I'd have to praise the Mix page. Nor is the vertical axis hard-assigned to level: it can adjust no parameter at all, be set to alter the send level to the Ambience processor, or alter front/rear balance (when using the applications' surround options). Another option, Room Mode, uses both X and Y coordinates to control level, pan, rear balance and the Ambience send simultaneously to more realistically place individual instruments in a space; again, though, this works best in surround mixing environments. The instruments then move around an imaginary listener placed at the centre of the stage. The Mix page (here from Darbuka) illustrates the excellent Stage graphic, here set to offer draggable control over pan and level. The shaded drum (a bendir) is muted in the track list below. Note also the individual track parameters; the ones here are those for the selected douhola. Another nice trick of this page is that clicking on a drum icon in the Stage immediately highlights the appropriate drum track in the lower window, even if it's not in the currently visible row of eight tracks at the bottom of the window. Incidentally, the Track Mute buttons have an unexpected graphical side-effect. Any drums that are muted are greyed out on the Stage — more handy visual feedback of the software's current state. The Track selectors echo those visible in the Play window (eight are visible, as in the other page), but the main part of this lower display is taken up with Track-specific parameters. First in line is a three-band EQ, edited directly via a displayed EQ curve. Clicking and dragging three 'handles' alters frequency and gain; the mid band even has a controllable Q parameter. In all, the EQ has a satisfyingly wide range of 50Hz to 20kHz. Each Track also has a 'Punch' parameter, a preset compressor that's roughly equivalent to the global dynamics section. Simplicity is again the name of the game: Power, Snap, Hard and Soft are the basic, informatively named presets, you choose the 'Drive' value with the continuously variable knob, and a neat meter that encircles the Drive control keeps you informed of the gain reduction in operation. Obviously, this effect suits percussive material especially well, allowing you to sculpt a sound's volume envelope as well as giving it some 'oomph'. Level, Pan, Ambience send and Rear balance controls are also located here (the last of which is operative in surround mode only), plus an individual output routing control. Reflecting the maximum number of Patterns in a Style, the applications can each have up to 14 mono outs, in addition to the main stereo out. How well these can be accessed depends on the host application. All 14 were easily available from within Cakewalk's Sonar. 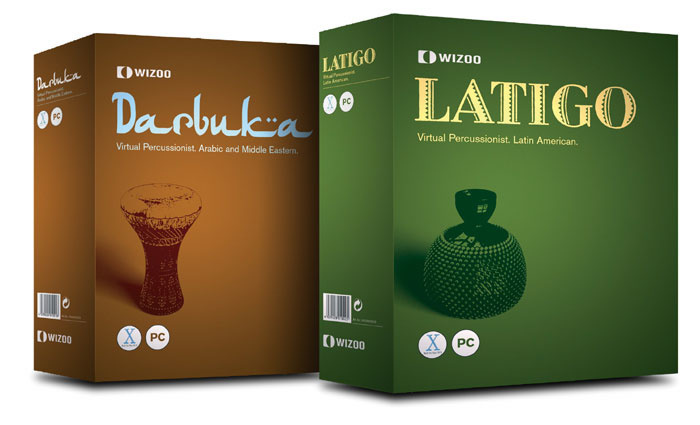 I mentioned near the start of this review that Darbuka and Latigo are operationally identical, but what this doesn't make clear is that despite the different exterior packaging, even the DVD case containing the installation disc is identical. Just like those strange two-in-one sci-fi paperbacks from the 1960s, one plug-in is featured on one side of the case label, and the other side features the other plug-in, though upside-down. If you've bought Darbuka, then the Latigo side will have a '30-day fully functional demo version' label stuck to it, and vice versa. With both plug-ins in front of you, opening their boxes reveals the same installer DVD with exactly the same contents. The certification card inside the case (and the overall package and manual, of course) makes things clear, but having both discs on your desk can be confusing. This method of distribution obviously makes economic sense in terms of Wizoo's tooling up for production, and the advantage to you, of course, is that you can try the software you didn't buy before you purchase it! You still have to buy two packages to get both plug-ins, though. The installation even includes this percussion encyclopedia: right-click on a track's graphical icons and up pop handy definitions such as this. The installation process is fairly straightforward: installers are provided for each of the different supported platforms on the Mac (VST, Audio Units and RTAS), but one 'certification', as the authorisation process is called, works for all platforms. In fact, I successfully 'certified' both applications installed on my Mac and PC. There is only one install for the PC — VST — though most serious software will support that format directly or indirectly. For example, I evaluated both plug-ins from within Cakewalk's Sonar 4 on the PC, which doesn't natively support VSTis. There is no stand-alone mode, so a host sequencer is a necessity. Note that the data folders which contain all the looped performances have to be dragged manually to a Mac's hard drive, whereas they're installed automatically as part of the process on a PC. Also, be aware that an update is available on-line for Mac users who plan to access the Audio Units versions via Apple's Logic v6.x and higher. Sadly, this had no effect on a strange anomaly involving the RTAS version: the plug-in seems to load into Pro Tools LE, but doesn't do so fully. There is no way to access the main window, as a result of which no patterns can be loaded. This issue was still unresolved as I finished my review. Steinberg's Cubase SX was a well-mannered host on both platforms, but be warned now that Wizoo's percussionists behave much more politely on newer computers with lots of RAM. I can report, happily, that Latigo and Darbuka were able to run on my ageing Apple G4. The overheads were manageable, and I was able to do a fair bit of other music alongside. Adding both to a session at once, though, threw Cubase SX over the edge — all sound ceased, and the Performance meter completely maxed out. The final window is the Edit page, and it's a busy affair, again split into two sections. The upper section provides you with a Pattern Arranger, whereby individual instruments playing loops can be stacked to create a finished Pattern. You do this by selecting instrument Grooves and assigning them to the horizontal slots next to a MIDI note. This is done via little pop-up menus, and the options available depend on the Style or Pattern chosen. Sometimes there's just one Groove option, sometimes several. It's also possible to assign track Mutes to MIDI keys, for instantly muting a Pattern or Groove at any point. Patterns don't have to loop, but they can be latched, which amounts to the same thing; being able to mute a latched Track gives more control over the final perfomance. In the Edit window, Grooves are assigned to MIDI notes to form triggerable patterns; individual track offsets are also accessed below. 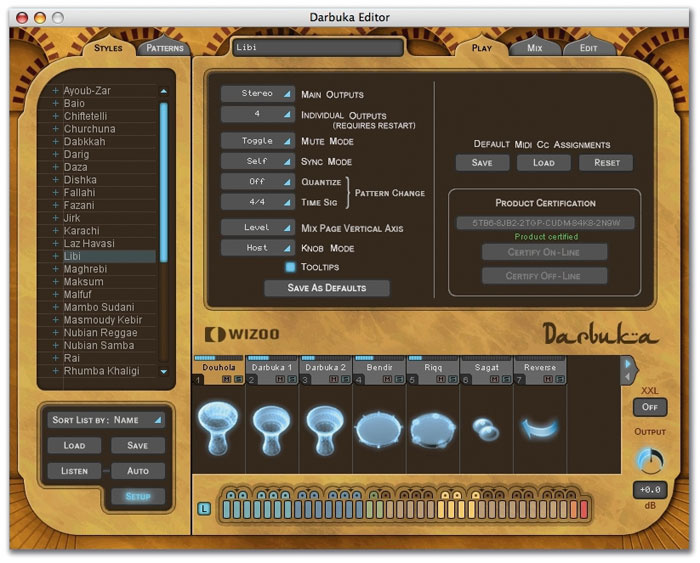 More Wizoo Flexgroove technology comes into play in the Edit page, since each drum track can have its own parameter offsets. The parameters here echo those offered globally in the Play page: Timing, Quantise, Complexity, Speed, Level and Variance. In addition, tuning, bend range, dynamics and decay parameters let you fine-tune the end result even further, and an offset option lets you alter the feel completely by delaying or advancing a track by up to 100ms. Note that the 'dynamics' parameter here isn't a DSP effect, but a way to control the volume difference between loud and soft hits. And bend range governs the effect of incoming MIDI pitch-bend data: you can't trigger individual drum sounds, but this offers one more way of controlling the performance. Though I tend not to gravitate towards software that is essentially 'preset', Wizoo's tools are quite flexible, given that you can't program your own Patterns. There are a lot of elegant touches in the user interface, not least of which is that X-Y mixing stage. The quality of the raw material can't be faulted, either — the included performances and recordings are top notch. And the variations and new patterns that can be coaxed from the basic looped samples with the Flexgroove engine do hold out the prospect of making your own contribution to the final output, too. Of course, you're still not really creating the patterns to start with. But how many of us have the cultural experience and rhythmic discretion (not to mention a sufficiently extensive sample library) to be able to create, within our standard MIDI sequencing environment, such stylistically correct, vibrant, musical patterns as the material presented here? Well, those of you who can will still probably save time with Darbuka or Latigo! And while I don't know exactly how much session percussionists charge (not ones this groovy, anyway), I'd guess that they wouldn't spend much time in your personal studio for £179. So give these instruments a try: your mixes may well thank you. Patterns can be varied and manipulated to a decent extent. No access to individual hits. Restricted to just the patterns supplied. Great recordings of great percussionists, shoehorned into an easy-to-use plug-in: it's like inviting these musicians to your bedroom studio for an indefinite sleepover. What's more, there's enough editability to keep things fresh, and to let you put your stamp on the software's output.